In a highly anticipated meeting with British Prime Minister David Cameron, Egyptian President Abdel Fattah El-Sisi discussed the security situation in the Egyptian resort city of Sharm El-Sheikh. Sisi also spoke of Egypt’s readiness to “cooperate with all of our friends” to ensure the safety of foreigners in Egypt, as thousands of British tourists remain in Sharm El-Sheikh. On Thursday, United Kingdom Foreign Secretary Philip Hammond announced Britain had received “intelligence” suggesting there was a “significant possibility” that the Russian plane crash that killed 224 people was caused by a bomb. 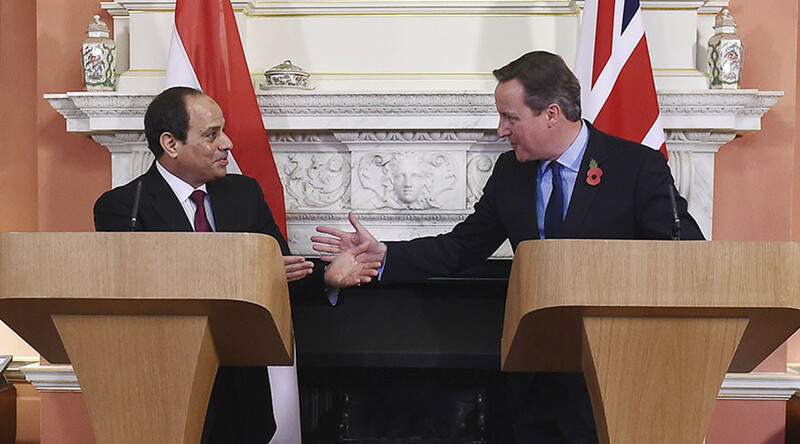 The focus on the plane crash and the situation in Sharm El-Sheikh comes as a disappointment to some who had hoped to see Cameron discuss Egypt’s recent human rights record with Sisi. A room of journos – and #Sisi. Will any of you ask about the day his troops killed 800+ protesters? Mass death-sentences? 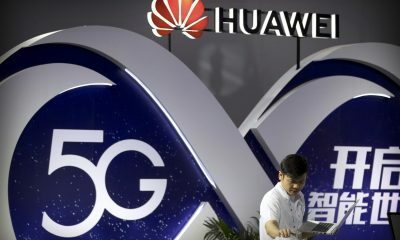 Disappearances? As the two leaders met behind closed doors, anti-Sisi protestors held demonstrations outside the Prime Minister’s office, with some dressed in white suits splattered in red paint. According to the Guardian, British police “physically removed” the protestors from the scene. 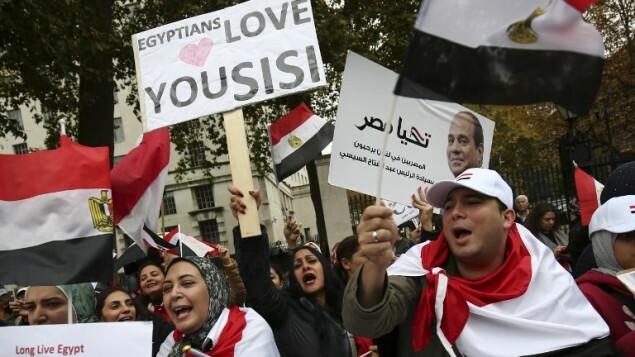 Last month, activists called for protests against Sisi’s visit to London and 44 British parliamentarians sought to rescind Cameron’s invitation to Sisi. Another group of demonstrators sought to show support for Sisi and chanted “welcome Sisi” while holding banners praising the president’s anti-terrorism efforts in Egypt. Terrorism has been at the top of Sisi’s government’s agenda for several months as a militant insurgency has been brewing in the Sinai provinces, where Egyptian security forces are embroiled in a bloody battle against jihadists operating in the region. Ahead of his visit to London, Sisi discussed the importance of preventing the spread of militant group ISIS and other forms of extremism in interviews with the Daily Telegraph newspaper and the BBC. He highlighted the situation in Libya, where foreign intervention that toppled Libyan president Muammar al-Qaddafi was “incomplete” and left Libya’s people to be “held hostage by militant groups”. 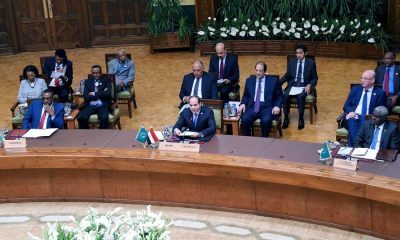 Sisi dismissed questions about his human rights record by pointing to the “war on terrorism” being waged in Egypt to “achieve stability”. “Don’t forget that we are plagued by terrorism along the 1000-kilometer border with Libya and Sinai and around Egypt,” Sisi told BBC correspondent Lyce Doucet in a televised interview. According to statements from the armed forces, army-led operations in the Sinai region have led to the death of over 200 militants.